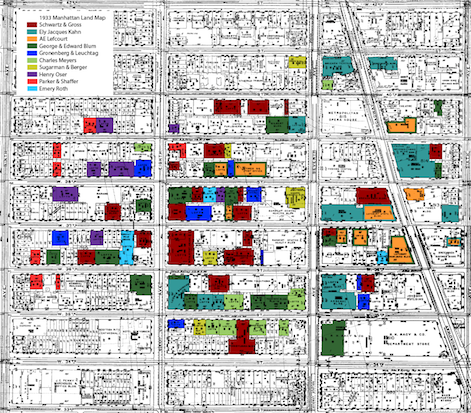 The land map of 1933 depicted above and in the slideshow displays in coded colors the buildings designed by the major architectural firms working in the Garment District. Of the 130 loft and showroom buildings constructed in the 1920s, 98 were designed by just nine architectural firms. The most prolific was Schwartz & Gross with 23 buildings, followed by George and Edward Blum with 19, and Ely Jacques Kahn of Buchman and Kahn, the one major figure among these little-know firms, who designed 15 loft and showroom buildings in the district. Others included Gronenberg & Leuchtag, Charles Meyers, Sugarman & Berger, Henry Oser, Parker & Shaffer, and Emery Roth.